Rhubarb is the vegetable you eat like a fruit! Every spring, this perennial vegetable makes its reappearance much to the delight of homeowners and gardeners alike, but how do you use up such an abundant veggie? Read on for a few suggestions. Rhubarb is an easy, fast-growing perennial and one of the first vegetables you can harvest from your garden each spring. It’s low in calories yet comes packed wtih vitamin C, calcium and magnesium, not to mention it’s low in saturated fat and sodium. Whether you are able to pick this unique vegetable right out of your garden or bring it home from the market, take the opportunity to give it a try with one of these ideas! Need to quench your thirst? Have a glass of rhubarb lemonade! Make a big pitcher or an individual glass, as rhubarb syrup will keep in the fridge for about a week. For the adults, splash in an ounce of citrus-infused vodka for a yummy spring cocktail. 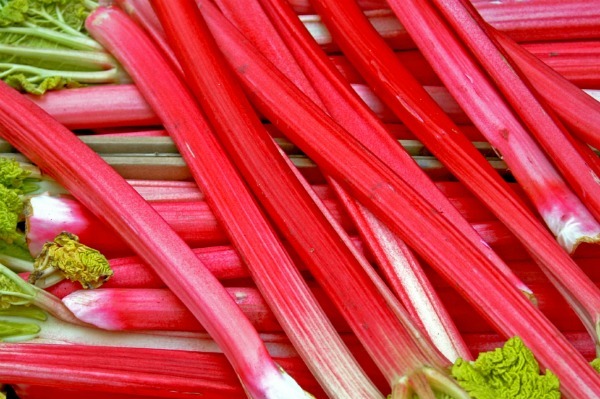 In a large saucepan, mix the rhubarb, sugar, water and lemon zest. Bring to a boil over medium-high heat. Reduce the heat and simmer, stirring often until the rhubarb softens and breaks down into mush, approximately 10–12 minutes. To create the rhubarb syrup, strain the rhubarb mixture by pressing it through a sieve or by hanging it in a piece of cheesecloth fashioned over a large bowl. Chill and store in the refrigerator. Add 3 parts of sparking water to approximately 1 part of rhubarb syrup. The tartness of rhubarb is a perfect complement to pork or a fatty meat dish such as lamb. Add a side of simple stewed rhubarb or a rhubarb compote to a grilled pork chop or over a pork tenderloin. Try a rhubarb chutney with a grilled lamb dish. Stewed rhubarb is also wonderful with ice cream and cake, over pancakes or even enjoyed just on its own. Add the rhubarb, sugar and water to a medium saucepan. Reduce heat and simmer uncovered while stirring occasionally until the rhubarb is tender but not completely broken down into mush, approximately 10 minutes. Add extra water if required. Taste and add more sugar if desired. Be sure to let the sugar dissolve completely, then remove the stew from heat. May be served warm or refrigerated for up to one week. When you consider that rhubarb seems more like a fruit than a vegetable, it’s easy to see why it is a great dessert treat. It partners perfectly with strawberries, such as in the classic strawberry rhubarb pie, or is a great option on its own, as in rhubarb crumble. Rhubarb makes a nice addition to cakes, muffins and scones. A simple rhubarb fool is a quick, yummy dessert to try. In a parfait glass or dessert dish, layer 1 portion of meringue, 1 portion of whipped cream, 1 portion of rhubarb, then repeat. Top with an extra dollop of whipped cream. Repeat with the other three parfait glasses.